Democrats and some in Trump’s own Republican Party have blasted the administration for separating nearly 2,000 children from their parents at the border between mid-April and the end of May. Medical professionals have said the practice could cause lasting trauma to children. While parents are held in jail, their children are sent to separate detention facilities. Video footage released by the government showed migrant children held in wire cages, sitting on concrete floors. “The United States will not be a migrant camp, and it will not be a refugee holding facility. It won’t be. You look at what’s happening in Europe, you look at what’s happening in other places - we can’t allow that to happen to the United States, not on my watch,” Trump said. He was speaking at the White House while announcing an unrelated policy. He has consistently blamed Democrats for the impasse, even though his fellow Republicans control both chambers in Congress. Democrats have accused the president of using children as hostages in the political dispute over immigration. “This was done by the president, not Democrats. He can fix it tomorrow if he wants to, and if he doesn’t want to, he should own up to the fact that he’s doing it,” Senate Democratic Leader Chuck Schumer said in a prepared statement. “Big mistake made all over Europe in allowing millions of people in who have so strongly and violently changed their culture!” he tweeted. Attorney General Jeff Sessions defended the way migrant children are being treated. “They’re not put in jail, of course. They’re taken care of,” he said at the National Sheriffs’ Association convention in New Orleans on Monday. 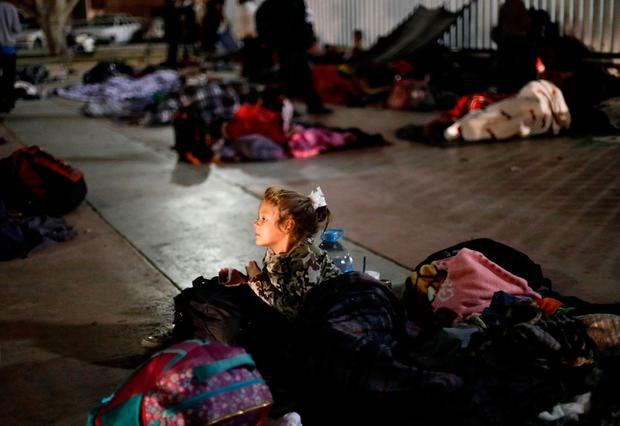 Trump administration officials say the zero-tolerance policy, which was not practiced by the two previous administrations, is necessary to secure the border and deter illegal immigration, but they are facing a growing chorus of criticism from their Republican allies. “Why we would even think that this is a tool that is needed to defend our borders is insane,” Republican Representative Will Hurd, who represents a Texas district along the border, told National Public Radio. United Nations Secretary-General Antonio Guterres weighed in, saying refugee and migrant “children must not be traumatized by being separated from their parents.” In Geneva, the top U.N. human rights official called on the Trump administration to halt its “unconscionable” policy of forcibly separating children from migrant parents. One would end the separation policy, fund the border wall and give legal protections to some immigrants who entered the country as children. Details were still in flux. His tweet about Germany referred to a political dispute over German Chancellor Angela Merkel’s open-door migrant policy that is threatening her governing coalition. More than 1.6 million migrants, mostly Muslims fleeing wars in the Middle East, have arrived in Germany since 2014. Contrary to Trump’s assertion, the crime rate in Germany is at its lowest point in more than 30 years, according to figures reported by the country’s internal ministry last month. Illustrating the wide concern in the United States over the family separations, Laura Bush, married to the last Republican president before Trump, took the highly unusual step of publishing an opinion piece in the Washington Post on Sunday, Father’s Day.